With the advent of network technologies such as 3G and 4G, mobile data traffic has been growing at an unprecedented pace and is increasingly outstripping the available mobile network capacity. 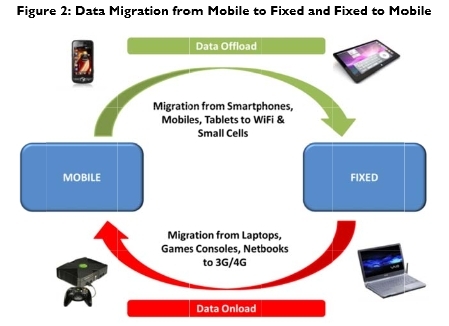 The introduction of smartphones, tablets, and other devices has been driving mobile data growth. According to the latest market study by Juniper Research, almost 50 percent of data traffic generated by these mobile phones, tablets and other 3G/4G connected devices, will be offloaded to Wi-Fi and Small Cell networks this year. This is equivalent to 10 billion movie downloads or 9,000 petabytes (PB) per year being offloaded from mobile operator’s networks. The Juniper market study found that while mobile network operators were benefiting from much needed relief on their over-subscribed networks, they were potentially losing monetization opportunities on the lost data usage. In response, mobile service providers are actively partnering with existing Wi-Fi networks and launching their own carrier grade Wi-Fi solutions. In addition, 4G technologies such as LTE along with other wireless technologies are enabling network operators to provide new services and next generation connected devices -- such as smart glasses. "While a 4G connection need not necessarily mean more data usage, consumers are in fact adapting to faster speeds and more data services, which could lead to more data usage," said Nitin Bhas, senior analyst at Juniper Research. The apparent increase in user demand for services in turn creates new opportunities within different economic sectors -- including commerce, energy, health and education -- completing a cycle of demand. Juniper noted that as network operators implement NGH (Next Generation Hotspot) and Hotspot 2.0 specifications, they will be able to provide users with a seamless authentication and access experience similar to that of the cellular network. Mobile data traffic generated by Smartphones, Featurephones and Tablets will exceed 90,000 PB by 2017.